Today I am participating in Tuesday Trade-Off with Trish and Bonnie from Uncommon. They are sharing an awesome tutorial with us today. I am sharing my Reversible Messenger Bag Tutorial on their blog, so be sure to check it out. We are Trish and Bonnie from Uncommon and we are so thrilled to be here today! We are excited to share our Jersey Garland Necklace tutorial with you as part of our Tuesday Trade-Off series! 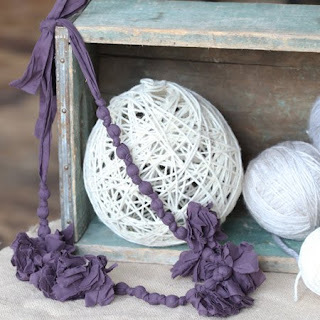 Have you seen the fabric covered beaded necklaces popping up out there? I love them! Here was one that really caught my eye by Ruche. I was shopping the clearance section of Wal-Mart yesterday and found a gorgeous peacock knit shirt and a set of beads to use to make one of my own. Here is how it turned out... I can't wait to wear it to a Mother-Daughter Valentines Brunch this weekend. So sweet! Make two casings about 1 1/2 inches wide and sew one end shut. I got lucky and could just snip the ties off of the shirt. Don't you love it when that happens? Make it as long as you'd like, depending on how long you want your necklace to be. Keep in mind you are going to use a good bit in the knots so be liberal. Turn the casings inside out. I used a turning tool. You'll see it a couple of steps down. If you ever make ties for anything, this is a lifesaver! Now, cut several strips and tie them on to the necklace where you would like them to go. I used strips that were about one inch by five or six inches. They don't have to be perfect. Use as many until you reach the fullness that you like. Make sure to tie some strips where you joined the two sides together. You are done! Thanks so much for having us Jen! We would love for you guys to join us on Uncommon anytime!